Adopted on March 17, 1981. After a campaign by the New Mexico Museum of Natural History, Coelophysis, (Coelophysis bauri,) became New Mexico's state fossil on March 17, 1981. Dinosaurs lived in New Mexico between 220 and 66 million years ago. These 154 million years encompass the Late Triassic Period and the entire Jurassic and Cretaceous periods of geologic history. They also represent nearly the entire time span of the dinosaurs, from their first appearance during the Late Triassic until their extinction at the end of the Cretaceous. 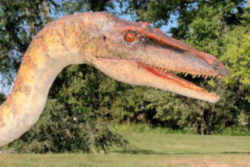 Coelophysis bauri is an extinct species of coelophysid dinosaur that lived approximately 203 million years ago during the latter part of the Triassic Period in what is now the southwestern United States. 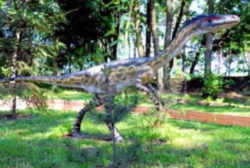 It is the type species of the genus Coelophysis, a group of small, slenderly-built, ground-dwelling, bipedal carnivores. It was originally classified in the genus Coelurus by Edward Drinker Cope in 1887. Dinosaurs became extinct 66 million years ago at the end of the Cretaceous Period. The Late Cretaceous dinosaurs from the San Juan Basin were some of the last to have lived on Earth. They are world famous because of the information they provide scientists about the cause of dinosaur extinction. Due to New Mexico's archaeological findings, such as the Folsom Culture and the Clovis Point, it is no wonder citizens working to establish the New Mexico Museum of Natural History, felt recognition was required for these contributions. It was decided that New Mexico should join a handful of other states that had designated an official fossil to represent the earliest days on this continent, and to honor continuing research in this field. 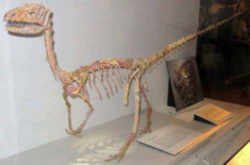 Hundreds of skeletons of Coelophysis were discovered at Ghost Ranch (Rio Arriba County) during the 1940s. This three- to four-meter-long, meat-eating dinosaur was one of the first dinosaurs on Earth and is the best known Late Triassic dinosaur. 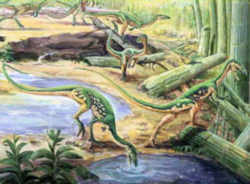 Led by Dr. Edwin Colbert in 1947, a team of paleontologists discovered a remarkable example of the Coelophysis (see-LA-fisis) in the Triassic Chinle Formation near Ghost Ranch, north of Santa Fe. Ceolophysis reached about 6 feet in length and weighed about 50 pounds due to hollow bones, and could probably run at fairly high speeds. It is considered to have been an carnivore, preying on small reptiles, amphibians and early Triassic mammals. It is also thought to have been warm blooded. In 1988, scientists at the New Mexico Museum of Natural History and Science discovered a new Late Triassic dinosaur near Tucumcari. They named this two-meter-long, plant-eating dinosaur Revueltosaurus, after Revuelto Creek in Quay County. Other Late Triassic dinosaurs known from New Mexico are only represented by isolated bones and teeth. Much more study and scientific collecting of New Mexico's Triassic dinosaurs remains to be done! A. The yucca flower is adopted as the official flower of New Mexico. B. The chaparral bird, commonly called roadrunner, is adopted as the official bird of New Mexico. C. The nut pine or pinon tree, scientifically known as Pinus edulis, is adopted as the official tree of New Mexico. D. The native New Mexico cutthroat trout is adopted as the official fish of New Mexico. E. The native New Mexico black bear is adopted as the official animal of New Mexico. F. The chile, the Spanish adaptation of the chilli, and the pinto bean, commonly known as the frijol, are adopted as the official vegetables of New Mexico. G. The turquoise is adopted as the official gem of New Mexico. H. The blue grama grass, scientifically known as Bouteloua gracillis, is adopted as the official grass of New Mexico. I. The coelophysis is adopted as the official fossil of New Mexico. J. The bizcochito is adopted as the official cookie of New Mexico. K. The tarantula hawk wasp, scientifically known as Pepsis formosa, is adopted as the official insect of New Mexico. L. "Red or green?" is adopted as the official question of New Mexico. M. "Red and green or Christmas" is adopted as the official answer of New Mexico. 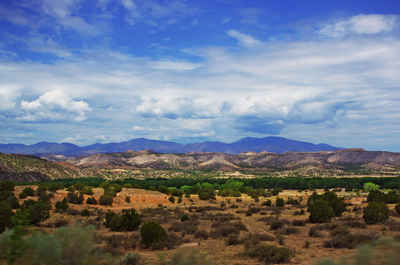 N. "The Land of Enchantment" is adopted as the official nickname of New Mexico. O. The Sandia hairstreak is adopted as the official butterfly of New Mexico. P. The New Mexico whiptail lizard, scientifically known as Cnemidophorus neomexicanus, is adopted as the official reptile of New Mexico. Q. The New Mexico spadefoot toad, scientifically known as Spea multiplicata, is adopted as the official amphibian of New Mexico. R. The hot air balloon is adopted as the official aircraft of New Mexico. S. The Cumbres and Toltec scenic railroad is adopted as the official historic railroad of New Mexico. T. The bolo tie is adopted as the official tie of New Mexico. U. The Native American squash blossom necklace is adopted as the official necklace of New Mexico. History: Laws 1927, ch. 102, § 1; C.S. 1929, § 129-101; 1941 Comp., § 3-1303; Laws 1949, ch. 142, § 1; 1953 Comp., § 4-14-3; Laws 1955, ch. 245, § 1; 1963, ch. 2, § 1; 1965, ch. 20, § 1; 1967, ch. 51, § 1; 1967, ch. 118, § 1; 1973, ch. 95, § 1; 1981, ch. 123, § 1; 1989, ch. 8, § 1; 1989, ch. 154, § 1; 1999, ch. 266, § 1; 1999, ch. 271, § 1; 2003, ch. 182, § 1; 2005, ch. 4, § 1; 2005, ch. 254, § 1; 2007, ch. 10, § 1; 2007, ch. 179, § 1; 2011, ch. 52, § 1. Most US states have made a state fossil designation, in many cases during the 1980s. 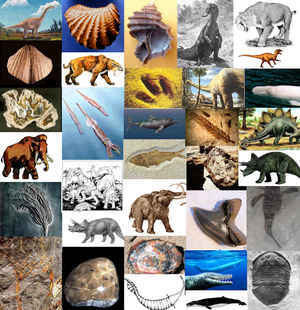 It is common to designate one species in which fossilization has occurred, rather than a single specimen, or a category of fossils not limited to a single species. Some states that lack a "state fossil" have nevertheless singled out a fossil for formal designation such as a state dinosaur, rock, gem or stone.